ITIL V3 was the de-facto qualification in ITSM for over a decade, helping thousands of organizations produce top-quality IT services. What do you need to know about gaining an ITIL V3 certification, and is the framework still relevant? Good e-Learning is here to answer all your questions! IT-enabled services have become a crucial part of our daily lives. Whether for shopping, traveling or simply communicating with friends, there seems to a variety of top-ranking services for virtually everything. Businesses are no different, with services doing everything from keeping things running from day to day to meeting the ever-evolving needs and expectations of clients and customers. In the current Digital Age, there are always new opportunities for services to be improved, giving organizations opportunities to save time and money while also achieving more reliable and higher-quality results. At the same time, customer expectations are constantly in flux, with companies rushing to meet demands for convenience, quality and accessibility to avoid losing ground to competitors. This has all made the management of IT services into a crucial corporate discipline. A number of different IT service management (ITSM) frameworks have appeared as a result over the years, with one of the most popular being ITIL. Formerly known as the ‘Information Technology Infrastructure Library’, ITIL offers a number of best-practice guidelines for planning, developing, deploying and continually improving IT-enabled services, helping users to ensure that they are constantly aligned with the needs of their business or organization. Would V3 certifications remain valid? Would V3 still be relevant? What is it about V3 that needed to be updated? Though ITIL 4 Foundation courses are now available, there are still many users continuing to study V3. The old syllabus is by no means outdated, and the certification program can still be followed. AXELOS has even specified that V3 certifications will remain valid. With that in mind, let’s take a look at everything you need to know about ITIL V3! The ITIL V3 certification path is fairly straightforward: students complete modules in order to earn ‘credits’, which in turn earn them the right to take higher level examinations. The variety of topics covered in the ITIL intermediate streams is one of the framework’s greatest strengths, as it allows students to choose modules which are more relevant to them. All students will need to start by earning an ITIL V3 Foundation certification, as this is a pre-requisite for taking later exams. It will enable users to contribute to ITSM teams and find opportunities in companies utilizing the ITIL framework. After gaining the ITIL Foundation certificate, students will move on to the intermediate modules. Some candidates choose to pursue ITIL practitioner courses at this point, though this is not mandatory. Once a candidate has collected 17 credits (including the two gained at from the ITIL Foundation certification), they will be eligible to sit the exam for Managing Across the Lifecycle (MALC). 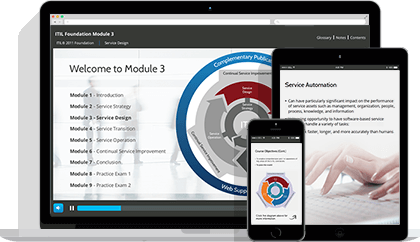 In essence, this section bridges the previous stages of the ITIL Service Lifecycle, showing students how to combine them in order to fully support an organization’s service delivery process. Passing MALC will demonstrate a candidate’s ability to use a combined approach to service management. The module will also help users to understand how to amend the Lifecycle and Capability streams for individual services and environments. Once a candidate has gained an ITIL MALC certification, they will have reached the level of ‘ITIL Expert’. The highest ITIL certification is not one that can be achieved with credits alone. To become an ITIL Master, a candidate will not only need to have reached Expert level, but they will also require at least five years of experience in ITSM working in higher-level management, leadership or advisory roles. They will also need to provide evidence of their ability to apply the ITIL framework in practical real-world environments. All of this will make a candidate eligible to reach Master level. Once they meet the required criteria, they must submit an application in order to become a Master. If this is accepted, the next step will be to submit a proposal, followed by a work package. Lastly, the candidate will need to attend an interview with several assessors. Should they pass this stage, they will officially become an ITIL Master. Should I Study ITIL V3 or ITIL 4? When ITIL 4 was announced, students and practitioners who used ITIL V3 naturally had a lot of questions. One of the first things you should know is that V3 certifications will remain valid even once the new version of ITIL is fully released, and the V3 syllabus still offers a great deal of valuable insight into effective ITSM practices. The biggest change that came with ITIL 4 was the increased involvement of the practitioner community. ITIL is globally recognized, and there are no shortage of users with practical ITSM experience. Calling on this pool of talent and experience helped AXELOS to create a framework which is more in-tune with current ITSM practices, and the community will also continue to provide support for users going forward. Another big update was an increased level of compatibility with other frameworks. As popular as ITIL is, it is not the only game in town! Soon after the new version was announced, AXELOS specified that it would be compatible with other ITSM standards, including DevOps, Agile and Lean. This will make ITIL 4 much easier for companies to incorporate into their existing ITSM practices. Now, onto the question of whether it is still worth studying ITIL V3. If you are currently studying intermediate modules, it may be a good idea to keep going until you reach the level of ITIL Expert. This will entitle you to take the ITIL 4 Managing Professional (MP) Transition module when it is released, which will update your certification to bring it in line with ITIL 4. If you are currently studying at Foundation level, or have just achieved your Foundation certification, it may be better for you to start over from the beginning with ITIL 4. The reason for this is that there is so much new examinable content that AXELOS is not planning to introduce a Foundation-level bridging course. How Much Does an ITIL V3 Certification Cost? It is always important to look at the cost of corporate training courses before making an investment. However, simply looking for the cheapest option out there will not be a good idea. Many of the companies which claim to offer quick and cheap ITIL training are not accredited by AXELOS, which effectively means that any resulting certifications will not be recognized. There is also the risk of simply being given poor quality training content for your money. You should also consider the value of an ITIL certification. According to Indeed, employees certified in ITIL can earn between $65,000 and $135,300 (or £25,000 and £70,000 in the UK). Granted, a certification alone will not entitle you to higher-paying ITSM management positions (particularly if you have only reached Foundation level), but with the right amount of experience, an ITIL certification could provide a huge boost to your career. The most important thing to remember is that an official corporate certification can go a long way in validating your skills and experience, and some hiring managers may even specify certain certifications for specific roles. Why Gain an ITIL V3 or ITIL 4 Certification with Good e-Learning? Good e-Learning is an award-winning e-course provider. Each of our ITIL courses is fully accredited by AXELOS, and we even provide FREE exam vouchers for when students are ready to take their certifications. You can find a full list of our prices by visiting our IT service management portfolio, or by contacting a member of our sales team. Crucially, Good e-Learning offers courses that cover the entire ITIL spectrum. This will allow you to gain all the points necessary to progress to ITIL Intermediate, Expert and Master levels.